This is a personal project by @dellsystem. I built this to help me retain information from the books I'm reading. Currently can only be used by a single user (myself), but I plan to extend it to support multiple users eventually. Source code on GitHub (MIT license). It is always the case that interpretation of this type indicates a dissatisfaction (conscious or unconscious) with the work, a wish to replace it by something else. Interpretation, based on the highly dubious theory that a work of art is composed of items of content, violates art. It makes art into an article for use, for arrangement into a mental scheme of categories. For morality, unlike art, is ultimately justified by its utility: that it makes, or is supposed to make, life more humane and livable for us all. But consciousness--what used to be called, rather tendentiously, the faculty of contemplation--can be, and is, wider and more various than action. It has its nourishment, art and speculative thought, activities which can be described either as self-justifying or in no need of justification. What a work of art does is to make us see or comprehend something singular, not judge or generalize. This act of comprehension accompanied by voluptuousness is the only valid end, and sole sufficient justification, of a work of art. All of which harkens back to Nietzsche's famous statement in The Birth of Tragedy: "Art is not an imitation of nature but its metaphysical supplement, raised up beside it in order to overcome it." 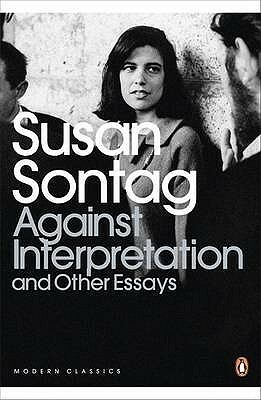 [...] Usually critics who want to praise a work of art feel compelled to demonstrate that each part is justified, that it could not be other than it is. And every artist, when it comes to his own work, remembering the role of chance, fatigue, external distractions, knows what the critic says to be a lie, knows that it could well have been otherwise. The sense of inevitability that a great work of art projects is not made up of the inevitability or necessity of its parts, but of the whole. The writer is the exemplary sufferer because he has found both the deepest level of suffering and also a professional means to sublimate (in the literal, not the Freudian, sense of sublimate) his suffering. As a man, he suffers; as a writer, he transforms his suffering into art. The writer is the man who discovers the use of suffering in the economy of art--as the saints discovered the utility and necessity of suffering in the economy of salvation. [...] his work, solely as a literary accomplishment, is not major enough to bear the weight of admiration that readers want to give it. One wants Camus to be a truly great writer, not just a very good one. But he is not. It might be useful here to compare Camus with George Orwell and James Baldwin, two other husbandly writers who essay to combine the role of artist with civic conscience. Both Orwell and Baldwin are better writers in their essays than they are in their fiction. This disparity is not to be found in Camus, a far more important writer. But what is true is that Camus' art is always in the service of certain intellectual conceptions which are more fully stated in the essays. Camus' fiction is illustrative, philosophical. It is not so much about its characters--Meursault, Caligula, Jan, Clamence, Dr. Rieux--as it is about the problems of innocence and guilty, responsibility and nihilistic indifference. The three novels, the stories, and the plays have a thin, somewhat skeletal quality which makes them a good deal less than absolutely first-rate, judged by the standards of art. Unlike Kafka, whose most illustrative and symbolic fictions are at the same time autonomous acts of the imagination, Camus' fiction continually betrays its source in an intellectual concern. [...] Camus is at its best when he disburdens himself of the baggage of existentialist culture (Nietzsche, Kierkegaard, Dostoevsky, Heidegger, Kafka) and speaks in his own person. This happens in the great essay against capital punishment, "Reflections on the Guillotine," and in the casual writings, like the essay-portraits of Algiers, Oran, and other Mediterranean places. The anthopologist is thus not only the mourner of the cold world of the primitives, but its custodian as well. Lamenting among the shadows, struggling to distinguish the archaic from the pseudoarchaic, he acts out a heroic, diligent, and complex modern pessimism. [...] In the world envisaged by Judaism and Christianity, there are no free-standing arbitrary events. All events are part of the plan of a just, good, providential deity; every crucifixion must be topped by a resurrection. Every disaster or calamity must be seen either as leading to a greater good or else as just and adequate punishment fully merited by the sufferer. This moral adequacy of the world asserted by Christianity is precisely what tragedy denies. Tragedy says there are disasters which are not fully merited, that there is ultimate injustice in the world. So one might say that the final optimism of the prevailing religion traditions of the West, their will to see meaning in the world, prevented a rebirth of tragedy under Christian auspices--as, in Nietzsche's argument, reason, the fundamentally optimistic spirit of Socrates, killed tragedy in ancient Greece. The liberal skeptical era of metatheater only inherits this will to make sense from Judaism and Christianity. Despite the exhaustion of religious sentiments, the will to make sense and find meaning prevails, although contracted to the idea of an action as the projection of one's idea of oneself.